Removing scratches and swirl marks requires the combination of a cutting compound and a car polisher machine. They are fairly easy to use but in the wrong hands, there is the possibility of making your paintwork even worse. The best car polisher is the Meguiars MT300 DA Polisher, which is fairly lightweight and ergonomically designed to reduce fatigue when machine polishing your vehicle. There are two main types of car buffers that include a rotary and dual action machine. The latter is usually the more expensive of the two but is less likely to cause damage to your paintwork, which means it is great for beginners. The ideal car polisher machine needs to be lightweight and have variable speed adjustments for different applications. The purpose of a car buffer is to reduce your hard work and time spent polishing your car as well as achieve a better finish. Purchasing your first car polisher for detailing is a big step in the correct direction. Most people started polishing their cars by hand but for better results when removing scratches, a car polisher machine is required. Investing into a quality machine will allow you to correct your own paintwork as well as apply other detailing products such as car wax. Below is a list of the best car polishers that include both rotary and dual action buffer machines. The MT300 Pro is one of the most popular DA polishers available by Meguiars. It has been designed by professional detailers and is suited for both advanced and beginner users. As it is a Meguiars product, you can expect superior quality and functionality. For those that have already detailed many cars in various sizes, you will understand the hard work required to polish a car. The Meguiars dual action polisher aims to reduce fatigue significantly with many new features. Overall, the MT300 is the best dual action polisher with everything you need to completely remove all defects from your cars paintwork. There is not one feature it doesn’t have and the reduced weight and ergonomic design provides the perfect combination of form and function. One of the most popular car buffer machines that professionals love to use is the Rupes Big Foot. As you can probably guess by the name “Big Foot”, it does have a unique selling point, which is the fact that is has a 21 millimeter throw. This means you are able to cover more surface area than the alternatives, which is great for large vehicles. Compared to other car polisher machines, the Rupes Big Foot gets the job done far more efficiently with the large throw. For those with large vehicles such as a trucks or SUVs, this is by far the best car buffer for the job. The Porter Cable 7424XP is the most popular car polisher available and is often included in many complete detailing kits. It is a 6 inch variable speed buffer that is offered at a relatively affordable price when compared to other polishers. For removing heavy swirl marks, this polishing machine is the perfect tool for the job. For heavy scratches in the paintwork, you will need to move slower with this car buffer but for the regular car enthusiast trying to keep their car swirl free, this is the best car polisher for the money. Dewalt are a worldwide brand that are known for their reliability and heavy duty build quality of their tools. The DWP849 car buffer is one of their most popular machines but it does come at a higher cost than other within this article. For tackling deep scratches and swirl marks, you will want a professional car polisher and that is exactly what the DWP849 is designed for. The constant circular motion of the rotary polisher ensure that you are able to remove any imperfections in the paintwork you are tackling. Overall, the DEWALT DWP849 is the best rotary polisher and although fairly expensive, it is a worthwhile investment that will last many years. Griot’s Garage have developed their latest buffer machine named the 10813STDCRD, which is an orbital polisher with a 10 foot cord. It has been designed for both beginner and experienced detailers and is a very popular polisher. Griot’s Garage also offer the 10813STDCRD with a 25 feet 16 AWG power cord for those that need extra length for tackling larger vehicles. Overall, it is a great all rounder and is suitable for everyone regardless of their experience. It also offers great value for money and is a highly effective dual action car polisher for tackling a range of paint correcting tasks. If you are looking for a polisher machine on a budget or you are simply new to using a car buffer machine, then the Neiko 10671A is your best option. It is cheap enough that it really does not matter if you rarely use it. The Neiko 10671A is a powerful and heavy duty car polisher that is excellent for those on a budget. However, it is fairly heavy at 9.3 LBS but this is mainly due to the heavy duty materials used within the construction of the car buffer. Overall, the Neiko 10671A is the best car polisher on a budget and can be used with a range of accessories due to the 9 inch backing pad. The process of polishing can be intimidating and is often misunderstood. Waxing and polishing are two different concepts because waxing simply protects the paint whereas polishing is done in order to break down and remove defects. Polishing your car by hand can still have excellent results by using the best car polish for your specific paintwork. However, you will never get the same results as you would with one of the best car polishers recommended above. Once you have successfully removed all defects, you would then go ahead and apply a protective wax to your paintwork to protect any further defects appearing. Properly polishing the cars paintwork requires you either to round the edges of the scratches or buff away an extremely thin layer of paint that eliminates the visibility of the imperfection on the surface. The removal of paint requires a very delicate touch, especially since the amount of paint that is removed will greatly depend on the amount of force that is applied when using the car polisher. If you are new to polishing with a machine, we highly recommend trialing it out on an older vehicle that you are not that worried about with regards to the paintwork. The spinning pads and the cloths attached to them are capable of removing blemishes and scratches with a cutting compound as well as applying waxes. As you can imagine, there are many different types of car polisher machines but the two main types include a dual action polisher (also known as a DA polisher) and a rotary polisher. Both have their own benefits and drawbacks and are suited towards certain applications. The rotary car polishers function on a single axis where the head spins in a regular circular motion. 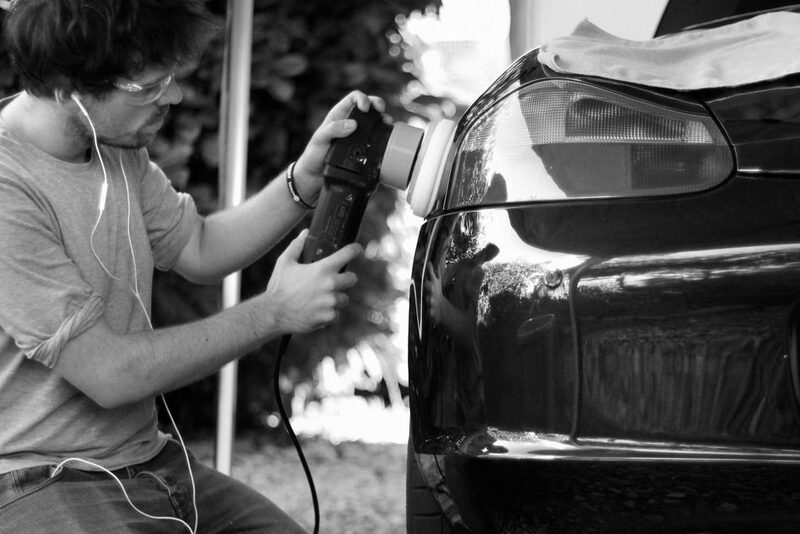 This results in the build up of heat and friction that allows you to work a cutting compound into the paintwork. Dual action polishers that are often referred to as DA polishers spin in two different motions (hence the term dual action). In short, the head spins in a concentric circular motion on a spindle, which results in a wider circular motion. 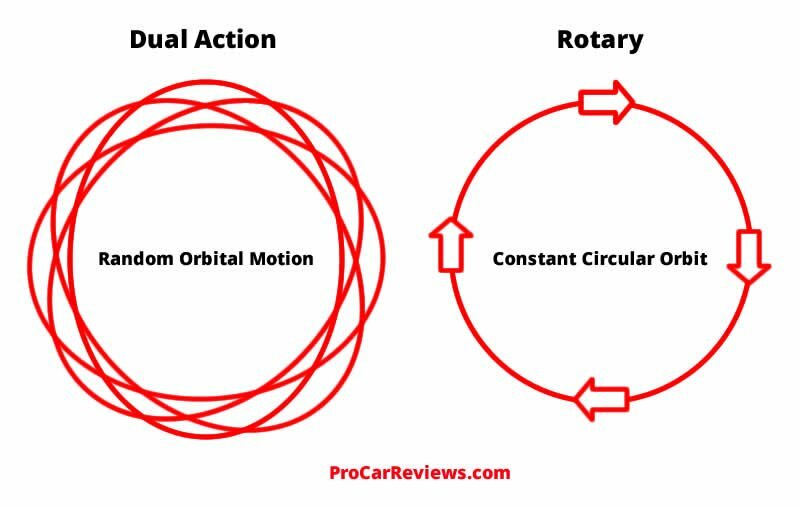 This type of circular motion prevent excess build up of heat or friction upon the same surface, which prevents any damage to the paintwork. Advanced models of dual action polishers are equipped with a positive drive action. They still allow the power tool to wobble in order to disperse heat and friction, but the wobble movement is actually purposefully driven as opposed to being the random result of oscillation. When it comes to choosing between the two different types of car polisher machines, there is various pros and cons for each. Rotary machines are normally cheaper and can be used for light to heavy paint correction work. However, in the wrong hands, there is potential to cause damage to your paintwork resulting in swirl marks, hazing and other defects. 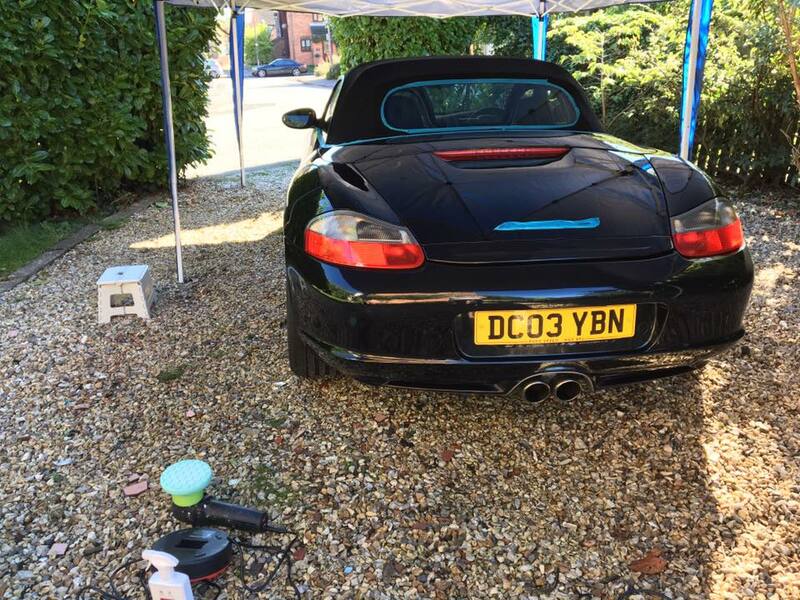 Dual action car polisher machines therefore are great for beginners that want to carry out light to moderate paint correction work. However, you may struggle with heavy duty correction work. One of the most significant considerations to make regarding a polishing machine is the weight. This is due to the fact you must be able to easily control and direct the tool in order to effectively work the cutting compound into the paintwork. For beginners, the lighter polisher machine is highly recommended as there will be less weight being pressed against the paintwork. This will reduce the heat and friction and will prevent the risk of causing any damage. The weight of the car polisher machine is one of many factors that define how easy the tool is to use. Of course, there are many other factors such as the ease of switching between the speed settings, switching between the pads, hand control aids and much more. 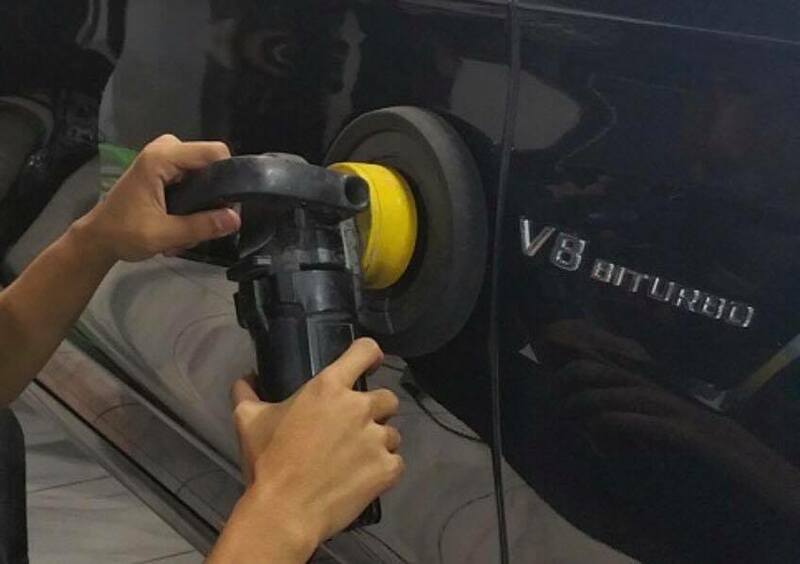 Technique is key to ensuring that you are actually correcting the paintwork and not making it worse. We highly recommend that you watch various video tutorials for helpful tips. Below are some tips to help you get started and safely polish your car. Due to the speed at which the polisher machine turns the buffing pad, it can be enough to cause damage. This can include causing permanent marks to plastics, headlights and other components. Therefore, before using any polisher regardless if it is a rotary or DA polisher, we highly recommend using masking tape around certain areas. In the below photo we taped up the brake lights, plastics and edges of the convertible roof. To ensure that the sun does not dry out the cutting compound, a carport canopy is also used to block the sun, which is also highly recommended. For those who are looking for a car polisher, there are multiple options to choose from. From car polishers for beginners to those that perform detailing tasks on a daily basis. However, you can have the best car polisher but if you do not have the technique to match, you will not be able to get the results that you desire. All of our recommendations are suited for a range of applications but we highly recommend you test on an old car beforehand. Once you have perfected your technique and tested a range of rubbing compounds, you should feel confident enough to correct the paint on your pride and joy. Excellent review, and thank-you very much for sharing your knowledge. Now I understand which type of machine I should purchase.